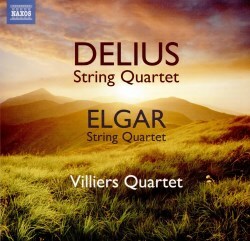 This splendid Naxos release by the Villiers Quartet, comprising string quartets from Delius and Elgar, deserves to be welcomed with open arms. The Delius was written in the midst of the horrors of the First World War while the Elgar was composed during the concluding months of the conflict. The quartets are impressive examples of the genre and the Delius quartet deserves to be heard far more than it currently is. Both quartets are in E minor and each employs some material from earlier discarded attempts at string quartets. Delius was around fifty-four years of age and living permanently in Grez-sur-Loing, France when he completed the original three-movement version of his String Quartet in 1916. The work was premièred that same year at the Aeolian Hall, London. Disappointed with the results, the next year Delius subjected the score to major revision which included reworking the outer movements, adding a Scherzo and entirely rewriting the slow movement titled Late Swallows. Delius must have been pleased with the new Late Swallows as he asked his amanuensis, Eric Fenby to make an arrangement for string orchestra. Here the Villiers Quartet has recorded the customary 1917 version of the string quartet. They have also included two movements from the original 1916 version: these are the opening movement and the first version of Late Swallows which have been compiled by Daniel M. Grimley from manuscripts held at the British Library. These make an interesting comparison with the revised versions. Incidentally these are highlighted in the booklet notes as world première recordings. Playing with a deep fondness for the work the Villiers feels in complete harmony with the predominantly gentle and bucolic character of the writing. Especially engaging is the playing of the lovely Late Swallows movement, both in the original and rewritten versions. This is a piece I have heard performed several times as a standalone work in chamber recitals. In the Delius String Quartet the commendable playing by the Villiers Quartet is worthy of comparison with the beautifully played 1995 account from the Britten Quartet on EMI. The Britten Quartet release has the highly desirable coupling of Howells’ Fantasy String Quartet and String Quartet ‘In Gloucestershire’ (No. 3). In 1918 Elgar wrote three major chamber music works: Violin Sonata, String Quartet and Piano Quintet, all of which were products from the peaceful rural retreat at Brinkwells near Fittleworth in Sussex. Here the Villiers Quartet is performing the three-movement String Quartet. Lady Elgar especially admired the Piacevole (Poco andante) movement, describing it as “captured sunshine” and it was subsequently performed at her funeral. The slow movement is quite ravishingly played, avoiding any cloying heart-on-sleeve quality. To close the squally writing of the Allegro molto feels joyfully uplifting. This elegantly played performance from the Villiers Quartet feels more captivating and sensitive than the 1995 account from the Maggini Quartet, also on Naxos, and it is now my first choice. Successfully recorded at St. Silas Church, Pentonville, London, the players benefit from vividly clear, well balanced sound. Also included is an extremely helpful essay titled Chamber Music in the Shadow of War by Daniel M. Grimley. This is a desirable chamber release with convincing and stylish playing from the Villiers Quartet who offer endearing expression and impeccable intonation throughout.